I'm trying a little bit of a health kick. Don't worry it probably won't last, but during this prolonged period of rehabilitating my knee after it's second surgery, I find I need to lose more weight. I've been exercising like crazy and have toned up a bit and lost some weight, but still I look in the mirror and things wobble that probably shouldn't. 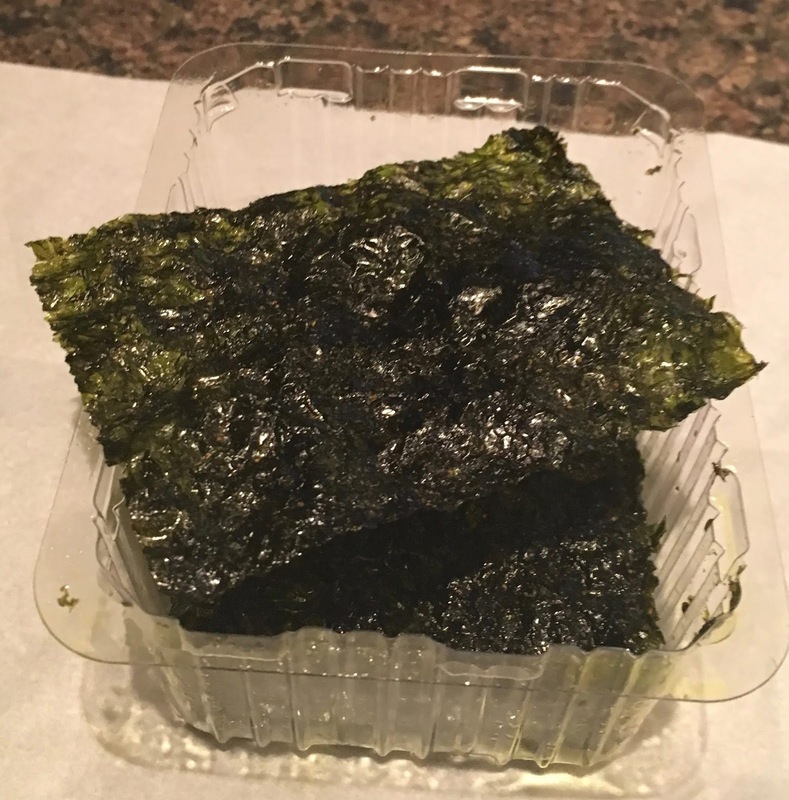 Produced in Korea these Seaveg Crispies are a Toasted Nori Snack. 'Nori' is the Japanese word for edible sea vegetables. 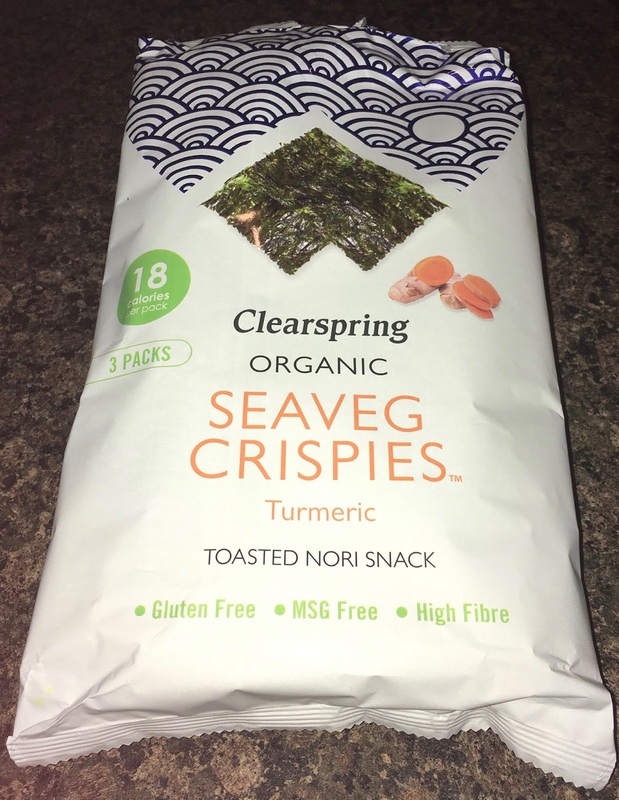 These Seaveg Crispies are Turmeric flavoured. Although not scientifically proven to have the long… long… long list of benefits Turmeric is vaunted to have, such as being good for the heart and it lessons swelling (around my knee), it does taste pretty sweet and is a member of the ginger family, so should be good for my tummy if nothing else. I have recently got used to drinking a Turmeric tea first thing in the morning, much to Cinabar's 'scientific chagrin'! There was a bizarre smell on opening the packet I haven't quite smelt before. It made me want to go and smell a Victoria Sponge Cake to get over it! Even more bizarrely the more I sniffed these vegetable(ish) smelling, mixed with grass, mixed with salt, mixed with turmeric Seaveg Crispies the more I started to get used it. 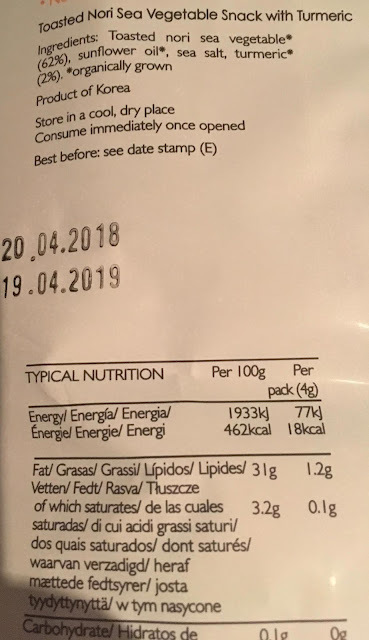 3 x 4g packets, each having 18 calories, with 1.2g of fat, 0g of sugar, and 0.1g of salt. They are organically grown, gluten free, have no additives or preservatives, are high in fibre (at 1.2g) and Vegan. Ingredients included; toasted nori sea vegetable (62%), sunflower oil, sea salt, and turmeric (2%).